A common misconception is that the perfect PCB size is one which would fit exactly within an 18.00” x 24.00” sheet. In reality, the fabricator must sacrifice some of the available sheet area for processing. 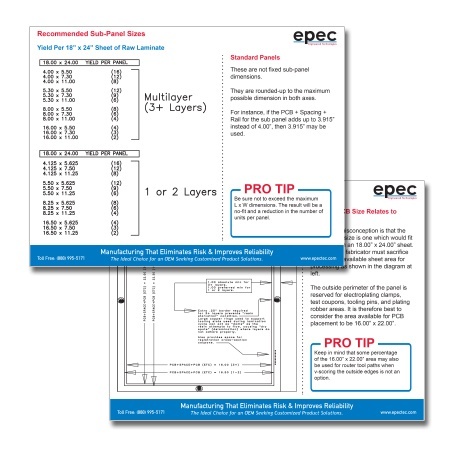 Download our Recommended Sub-Panel Sizes for Printed Circuit Boards tip sheet to learn more about how material utilization could lower your PCB costs. This tip sheet inspired by our recent product webinar titled Planning Your High-Tech PCB Design for the Lowest Possible Cost. Feel free to view the YouTube recording or slides on SlideShare.